When it comes to hearty, husband salads, I use this one deep bowl, chilled. For company, I'm up a creek. How do you serve your salad: on a plate, or in a bowl? What makes a homemade salad feel restaurant quality? If I'm having a sit down dinner I would use the bowls that match my china for individual salads. Most often, I have 2 large bowls that I like to use. One is a deep rich wood and it's GIANT. The other matches my everyday china and it's large enough for a crowd. If I'm being concerned with presentation (which I'm not always!) I would toss the salad in a mixing bowl, transfer to the serving bowl, and garnish. I definitely prefer a bowl. But if I'm only eating salad, then a plate is fine. What I can't do is a small salad on the same plate as the rest of my food. Just. Can't. Do it. That salad looks delicious. If the salad will be a first course, I preserve it on salad plates. If it is a very casual buffet, I put it in a large bowl with wooden serving pieces. I always serve it dressed with a simple oil and vinegar I make myself. (I don't like seeing a bunch of salad dressing bottles on the table, and the oil and vinegar is quite healthy.) For the "extra" touch I add toasted nuts, a few rinsed black beans or black olives for color, and thin slices of pear for sweetness, and whatever other interesting things I might have in the pantry. If you like blue cheese, that always adds a great zip! I like a side salad in a bowl, but a main dish salad on a plate. Here's the A Slew of Summer Salads Carnival that we're hosting on our blog. It includes our favorite Fresh Asian Noodle Salad. I have a set of white bowls--the wide, low, soup bowls?--those are ideal--big enough for a decent salad, but shallow enough to not require a whole lot of salad (and plenty of room for garnishing, too). I got a set of 4 on clearance from either PB or C&B a few years back, but you can find them all over the place. Since I have 'all white' dinnerware, I can mix and match, so if I was having a fancy formal dinner, I'd use my good china (which has really small bowls and plates)...but since I don't do that often at all, most of my meals are served in my everyday dinnerware--and I've gathered a selection of bowls in various widths and depths. A friend from church uses the prettiest white and blue plate. It's about 18 inches wide, at least. I think it weighs about 40 pounds. lol I think of you every time I see it! I am often amazed at how LITTLE and SIMPLE restaurant salads are. 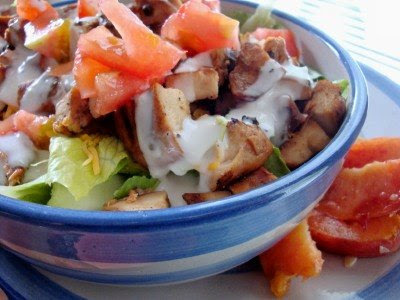 The typical salad with a meal is usually a handful of iceberg leaves, a couple rings of onion, 2-3 cherry tomatoes, and dressing. One thing I have learned from restaurant presentation is to pre-wash my lettuces, dry and chill in paper towels before serving. Rushing and serving wet leaves makes a disappointing salad. I use a big bowl but usually have waste with that method. For serving: If it's a main course salad I have a huge pottery dish (looks like an oversized pie plate) that I use and a smaller size that works great if it's a side salad. Love both of these bowls -- bought one from Silver Dollar City, the other one in Germany. For eating: I have low, shallow bowls (for soup or pasta) that I use. They're plain white so they're easy to mix with other dishes. we LOVE salads around here. for small family meals, we eat salads on plates. for bigger groups we serve in a large glass bowl i got inexpensively at crate & barrel, which can double as a mixing or bunch bowl if needed. restaurant quality? mixed organic greens, toasted nuts, sprinking of fresh blue cheese, fresh seasonal fruit, and homemade vinaigrette dressing. I like to use large platters to serve individual salads on. There is more room to chase around the lettuce and toppings! I love that you chill the bowl...great idea. I usually make our salads family style, in one big bowl. But I'm sure my husband would appreciate his own nice, big bowl! We don't eat a lot of salad in our home because the hubby is not big on raw veggies. I love salads in a bowl when I have it. Your salad looks yummy! Can you tell me what you have in it? I have some shallow bowls that came with a white dinnerware set from KMART. They are my favorite for salad. I think what makes a restaraunt quality salad for company is good greens...no iceburg lettuce! Homemade dressing (it's to easy...I don't know why more people don't do it), and that little unexpected "something." Dried cranberries, candied walnuts, strawberries or mandarin oranges, or even edible flowers are interesting and delicious additions that your guests will oooh and aaah over. Hey, I mentioned you in my recent blog post about using what you already have for crafts and decorating. Check it out. If the salad contains meat, I use a big platter. Otherwise, I use a huge salad bowl that I bought with a gift card for Pier 1 about 10 years ago. 1. Make your own dressing. It's cheap, easy, and it always tastes better. 2. Make your own croutons. Everyone loves them, and it's a great way to use stale bread. Wal-Mart sells those huge baguettes for $1.50. That's a lot of croutons. 3. Season the salad. Add a big pinch of herbs (dried or fresh), and don't forget the salt and pepper. 4. Use at least one interesting ingredient (i.e. toasted walnuts, pepperoncini, pine nuts, capers). Or go to the deli counter, and ask for an ounce or two of prosciutto or a meat you've never tried. 5. Experiment with presentation. The same ingredients work differently depending on whether you chop, slice, tear, dice or smash. You can also "upgrade" your salad by layering the ingredients or serving the salad on a platter with the "wet" ingredients (like tomatoes) placed around the greens. I have a lovely set of formal china and a collection of blue and white dinnerware. I never use either. I love my mismatched white china. When serving sit-down salad to 1-4 folks, I pre-serve on salad plates. For buffets, it's a help-yourself, one-plate deal. I use 8" plates for buffets. I like to serve a simple, homemade dressing that I put in a somewhat oversized gravy boat for buffets and a std. sized gravy boat for sit-downs. This allows guests to control the amount of dressing and prevents any waste of expensive salad fixins. That is a BEAUTIFUL bowl. I love it. Are you familiar with Chatham Pottery? Looks a bit like one of their pieces- very Cape Cod summer. I use a massive ceramic bowl for your afforementioned chilling component but love the look of grainy wooden ones. I inherited my mother-in-laws wooden salad set from the 1970's. The serving bowl is GIGANTIC so its perfect for company and buffets and I looooove the retro look (I also got her cool retro wood handled flatware set). However if salad is the main course and its just our little family then I use those shallow soup bowls/pasta plates. I also agree with the person who suggested pre-washing lettuce. A tip I picked up from Dean and Deluca is to submerge and wash the entire head of lettuce when you get home, shake it out then wrap the whole head in paper towels before storing back in the fridge. It's then ready-to-go, lasts longer, and you don't have to mess with a salad spinner. I think I agree with the folks who say prsentation differs based on when you serve the salad--main dish, platter; first course, dish up in the kitchen on individual salad plates; as a palate cleanser before dessert, I'd also dish up on separate plates. I have come to the conclusion that bowls don't work terribly well because all the tasty interesting bits, like tomatoes, fall to the bottom since they're heavier than lettuce. On a platter you can get some of everything. I have four largish bowls that I serve small gatherings in. They are sold as "small vegetable bowls", and they are bigger than cereal bowls, but really smaller than serving bowls. Perfect for casual soup and salad meals. If I have larger groups, then I have these pasta bowls. Kind of like a salad size plate, with a small rim around the edges. In my experience, the larger the group, the less people eat, so these work well for a big group. For company or potlucks, I serve my salad in a large wooden salad bowl with matching serving utensils. At home we eat salads in a bowl or on a plate. Just depends on how much other food is being served at the time. If the salad is the main course, then it's always served in a bowl. Grind some Salt and Pepper on the greens before you add anything else. It makes an amazing difference! I usually mix my salad up in a big pyrex bowl. I usually use my big tupperware "thatsa" bowl if I am making a salad for a crowd. To dress up a salad and make it more filling I like to top it with some more expensive, filling, fancy ingredients like chopped nuts, sunflower seeds, shredded cheese, crumbled real bacon (not bits) or chopped meats. Ingredients like this make the salad a real meal. I always serve the dressing in the side so everyone can have their favourite and leftover salad will keep without going soggy. Wow, Sharon, I'm trying that tip TONIGHT. Thank your husband! We have cheap shallow clear glass bowls from a restaurant supply company closeout that I keep in the freezer for salads - they are getting very 'etched', so I am on the lookout for something to replace them. So far it's been softball every Saturday morning so I haven't been yard sale shopping, but hopefully I'll find just the right thing when I finally do get to look in earnest! Salad served in a trifle bowl is lovely! You can layer the ingredients and it is a really pleasing display. Although expensive, a salad spinner is really and truly essential for salad making! I found mine at a salvage store for two dollars. It dries leaves quickly and easily. Like someone else said, a salad spinner is an absolute must. I paid full price for the one that one of the big cooking magazines recommended (although I only bought that one because it's the only Target had) and have never regretted it. I use it many times per week. My husband prefers his salad in a big bowl. I never think to chill it. We're having taco salad tonight, I think I'll chill the bowls now :D He also likes it when I put the greens and dressing in a big bowl and mix it all up with tongs before serving, so the dressing gets better distributed. That's how we did Caesar salad in restaurants. If I really have my act together, I'll put on sprouted sunflower seeds, raisins, dried cranberries, sliced olives, any kind of chopped nuts, and croutons always make it feel special. I like my salad on a plate so I can evenly spread out all the different toppings and get a little with each bite. I also like a wide, shallow soup-type bowl, that I wouldn't dream of using for soup :) for my salad, if it's a side salad with a meal. 4. An interesting dressing - asian sesame, maple fig, tomato - anything but the old ranch or italian. I usually use just the standard cereal bowls from my dish set when serving guests. (For myself I use a big plastic one so I can toss it around without spilling.) For me, a good dressing is key. (Usually grape seed oil, white basalmic, garlic, dijon, and a few fresh herbs.) But I also love throwing in grapes halved or sliced strawberries or dried cranberries (a little touch of sweet to counter all of the savory), some feta, and a handful of pistachios or pecans. But with a good dressing, I could live with just lettuce. Tortilla bowls (similar to these: http://www.amazon.com/Nonstick-Tortilla-Bowl-Makers-Set/dp/B00005EBH7)! My husband LOVES salad in one of these. I'm trying to get my family to eat more salad but boy are they picky! So, I took one of those vegetable servers and put a different ingredient in each compartment and then each person can assemble their own main dish salad. That way I can have chicken while DH (vegetarian) can stick with something else. DD (no hard foods due to braces) can stick with softer vegetables, grated carrot, etc. Can I just say THANK YOU? You are the most creative group of people. I feel very inspired now about whipping up a couple of great salad meals for our guests. Not as beautiful as a lot of stuff you have but works??? Maybe?? Oh wait, I just realized you meant individual servings. OOPS!! I serve it on our glass plates and when I remember, I chill the plates before dinner. if the meal is just the salad, then we use the "big blue bowls". A generous wooden salad bowl works well for us. My favorit salad mix; mesclun greens, garbanzo beans, sliced onion, chopped carrots, and crunchy croutons. I usually make my own salad dressing; olive oil, balsamic vinegar, freshly ground peppers, salt, a dash of dill and a small handful of grated parmesan or pecorino cheese. If my salad is the main course, I use the whole plate to dish the salad. If it's a side, I have some bowls that are wide shallow that I like, because you don't end up with a pile of undressed lettuce at the bottom. To make it restaurant quality, I like to pre-dress the leaves, and then nicely arrange ingredients on top. I have a steak salad that I do that way. Often I'll season and grill salmon, and serve it atop one of our salads. An instant meal! We have simple white dinner plates that I put in the freezer about an hour before dinner. I have several main dish salads that I make from my Nordstrom's Entertaining at Home Cookbook and it feels fancy to have a place set with a chilled plate heaped with salad. It's a nice touch-try it. My husband teases me that I give a restaurant big points for using candied pecans in a salad, so I love to do this at home too. I have such a sweet tooth, so I always love fresh or dried fruit also. I have a favorite salad recipe on my blog called summer turkey salad. I served it last year for a Mother's Day luncheon, then presented it later in flower pots to fill lunch gift baskets for teachers. Yum! If we're having grilled something on top, I have these shallow bowls that are more like plates with an edge - they work great for holding the meal, plus the presentation is nice. For something tossed, we have these saimin bowls - saimin is an Asian noodle soup, served in a bowl almost as big as a vegetable serving bowl. They work great for big salads, and you can find them in many Asian markets. If I'm serving salads that are the main course, I like to use pie plates. I don't have enought for a crowd, but they're perfect for just us! a lot of times we use our "soup plates" or "pasta bowls" or whatever you call them. For the two of us we usually just serve the salads up in the kitchen in those bowls adding the things we like to the top. We use pasta bowls. Easy-peasy and can make a big ol' salad that generally serves as the main course.